For other uses, see Alawi (disambiguation). The Alawi Sheikhdom (Arabic: مشيخة العلوي‎ Mashyakhat al-‘Alawī), or Alawi (Arabic: علوي‎ ‘Alawī) — was a Sheikhdom located in the Adan region of southwestern Yemen. Its capital was Al Qasha. The state was abolished in 1967 with the independence of the People's Republic of South Yemen. `Alawi was one of the original "Nine Cantons" that signed protectorate agreements with Great Britain in the 18th century. In 1863 it became part of the larger British Aden Protectorate, coinciding with the opening of the Suez Canal in the same year. In the 1960s it was in the Federation of Arab Emirates of the South, and its successor, the Federation of South Arabia. 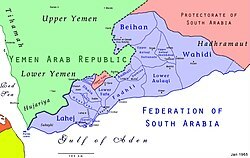 The last sheikh, Salih ibn Sayil Al Alawi, was deposed and his state was abolished on 28 Aug 1967 upon the founding of the communist-led People's Republic of South Yemen (1967-1990). Since 1990 the area is part of the Republic of Yemen. The rulers of the `Alawi Sheikhdom had the style of Shaykh al-Mashyakha al-`Alawiyya. This Middle Eastern history-related article is a stub. You can help Wikipedia by expanding it.